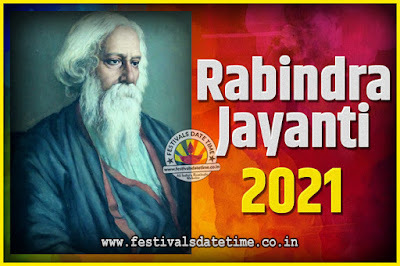 Rabindra Jayanti is an annually celebrated cultural festival, prevalent among Bengalis around the world, in the remembrance of Rabindranath Tagore's birthday anniversary. Birthday of the noble laureate Rabindranath Tagore is celebrated on 25th day of Baisakh. He became the first Indian who received the Nobel Prize in 1913 for his great writing named “Gitanjali”. It is celebrated with equal fervour at Shantiniketan, the university started by Rabindranath Tagore. The celebration of Rabindra Jayanti is among the most important festivals for people in Bengal. All cultural activities during the Jayanti are held at Jorasanko Thakurbari. Music, skits, dramas, traditional songs and dances are performed in institutes and theatres are followed by the distribution of awards.